Clayworth is in the central area of English Plough Plays, which are the mid-eastern counties of Lincolnshire, Nottinghamshire and Derbyshire. A few centuries ago most villages would have had a Plough Play. Although all the plays have the same structure, there would have been plenty of local colour, giving variation across the villages. It is a shame that most plays were lost, if not in the First World War, then the Second. We in Clayworth are very lucky because ours was collected and published many years ago. Plough Plays are traditionally performed at the start of the farming year; the beginning of January. All plays of the mumming type represent the fields dying in the winter and the rebirth of the earth each spring and the following harvest which allows us to eat, although today our stomachs are connected more closely with the supermarkets than the seasons. 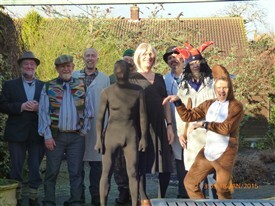 Our Plough play was found by Dr. Glyn Smith and performed in Clayworth by the Idle Plough Jags of Retford in 1984. Since 1987 the villagers have performed the play each year. This is now over 25 years and it’s a different performance each year! The play would have originally been taken to people’s houses and I know of someone who saw the Play, living as a young boy in Wheatley, just before the First World War He remembered many people crowding into a Wheatley house to see the Clayworth Plough Play! Each year the Clayworth Plough Play is toured around nearby villages on a January Friday, together with a Blessing of the Plough in St Peter’s, Clayworth, on the Sunday and lunchtime performances in all the village pubs. The play has the rare ability to bring together the few local farmers with the rest of the villagers who today are not connected with agriculture; although that ratio would have been reversed before the wars! The fundamental purpose of these plays is the generation and distribution of luck and fecundity. So ensure you’re there to enjoy your share! This page was added by Website Administrator on 27/07/2015.